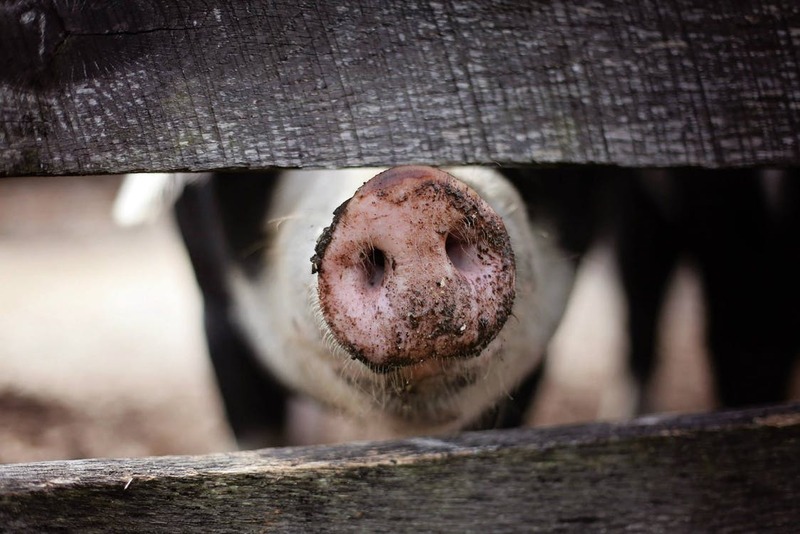 When the first fleet came to Australia in 1788, they brought pigs with them. Initially kept in unrestrained and semi-feral conditions, escape was easy, so by the 1880s pigs had started to run wild in New South Wales. Today, the feral pigs occupying Australia by the millions are descendant from various breeds of domestic pigs. But, what characterises a wild pig, and why is their presence a cause for concern in Australia? Where do Feral Pigs Live? Australia’s wild pig population typically reside in New South Wales, Queensland and the Northern Territory, as well as the Australian Capital Territory. They can also be found in isolation in certain areas of Victoria, throughout the forested areas of the South-west of in Western Australia and the Kimberley, as well as on Flinders Island, in Bass Strait and on Kangaroo Island in South Australia. 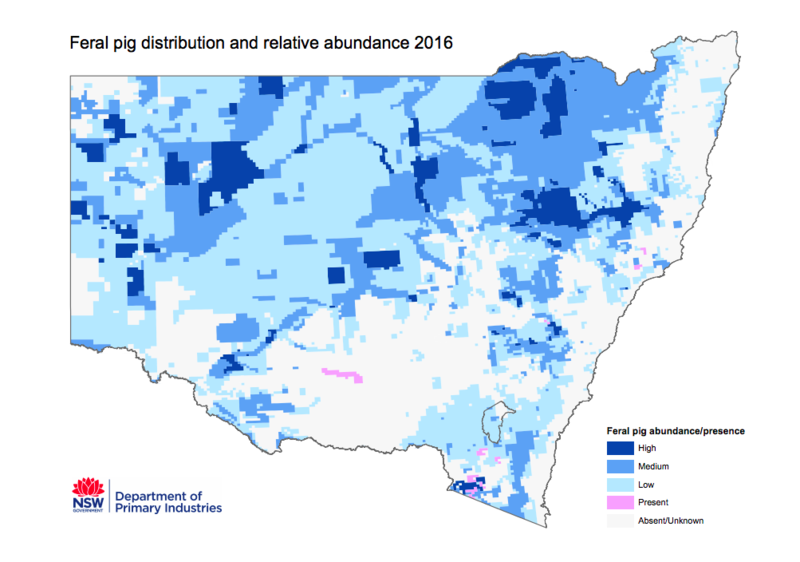 The below map indicates the distribution of feral pigs in New South Wales, where their populations are the most abundant. They usually flock to moist areas where they can find adequate food and water, and enough shelter to protect them against the harsh Australian weather – especially dense shelter for protection against high temperatures. There are a few different type of habitats in Australia that cater to these requirements, including monsoon forest patches, rainforests, paperbark swamps, and open floodplains, as well as marsh areas, semi-arid floodplains, dry woodlands, subalpine grasslands and forests. Australian feral pigs aren’t known for travelling, with each pig having a home range of only about ten to approximately 43km2. Feral pigs in Australia tend to restrict their activities to cooler parts of the day, as they’re usually nocturnal in hotter temperatures. This is why pigs tend to like rolling in mud, as it helps to regulate their body temperature. Sows and piglets usually run together in groups, as do some younger males and females. When they’re about 18-months old, males tend to become more independent, only re-joining groups for mating or when feeding on localised food sources. How many pigs form a group will depend on the area, as it’s uncommon to see a group of more than 12 wild pigs in Western Australia, but in other open country areas 40 or 50 pigs can form a mob. In terms of their diet, feral pigs typically eat vegetation, fruit, grains and creatures like insects, frogs, worms, fish, birds and small mammals. They also eat underground plant material like bulbs and fungi. Feral pigs can carry and spread a number of diseases, many of which can be harmful to livestock and humans. Murray Valley encephalitis and other arboviruses. Tuberculosis and sparganosis, through eating inadequately cooked feral pig meat. Feral pigs negatively affect agriculture in Australia, as they prey on newborn lambs, and reduce the yields of grain, sugarcane, fruit and vegetable crops by consuming or trampling on them. Wild pigs also damage fencing and foul water sources through wallowing and defecation. They also have a significant environmental impact on the areas they frequent. This is because they uproot soil, grasslands and forest litter and consume a large variety of native plants. Feral pigs are considered a threat in Australia due to their predation, habitat, degradation, competition and disease transmission. Fences can be built to protect valuable areas. Effective pig-proof fencing can be built, however, the fencing does require constant maintenance. 1080 poisoning can provide effective initial control of pig numbers when it is undertaken in a methodical manner. This method is particularly effective when other food sources are scarce, as it’s often mixed with grain or manufactured pallets. There are also manufactured bait products available for purchase. However, only authorised persons can distribute feral pig poisons, and care has to be taken to ensure it is done properly. There are regulations in place around aerial bating, however, it can be an effective means of control in areas where land control is impractical or if the impact of feral pigs within an area is significant. Helicopter shooting is an expensive method of control but is a good option for when an area is inaccessible from the ground. Ground shooting can be effective but should not be undertaken when trapping and baiting programs are being conducted. It is generally better to undertake shooting when only small mobs are present, or after trapping or baiting. Trapping can be useful as a follow-up to an initial round of animal control and is effective when trying to maintain lower levels of the feral pig population within an area. 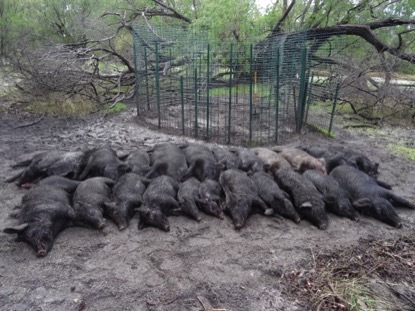 Trapping can remove large numbers of pigs if conducted properly. A single trap can remove a substantial number of feral pigs. To learn more about feral pigs and animal pest control in Australia, contact the team at Animal Pest Management Services today!